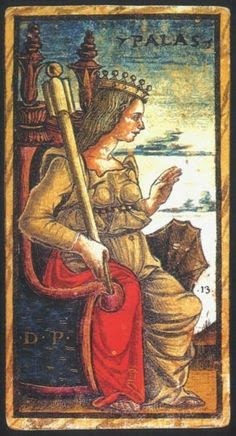 In an earlier post, Heroes Warriors and Worthies, we took a look at the naming of the Court Cards in French playing card decks and how these have been incorporated into Dame Fortune’s Tarot Wheel. 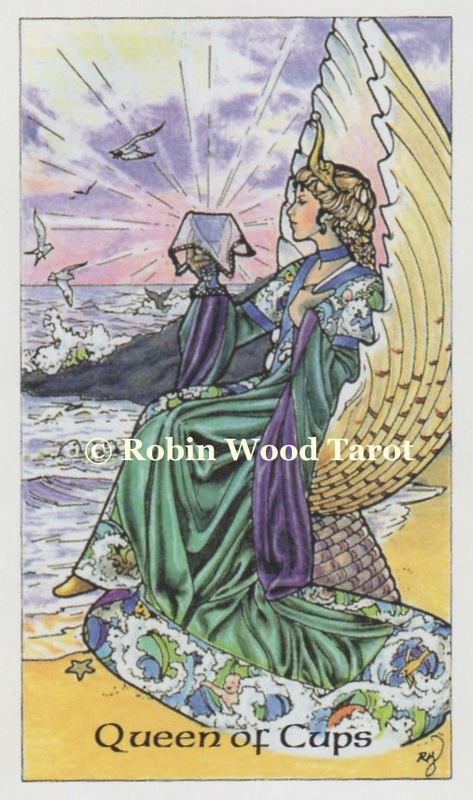 Another deck that incorporates named court cards is the Sola Busca Tarot. 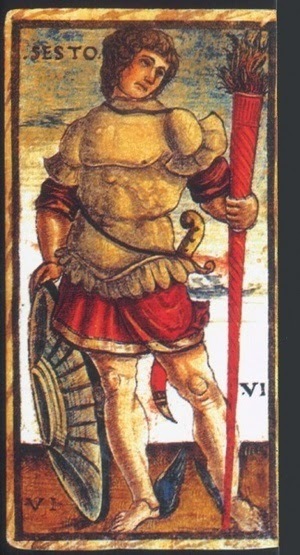 This deck originated in Italy during the late 15th Century and is quite different from other Tarocchi decks in that it is entirely populated by warriors (with exception of the Court Queens). The Majors are all named. 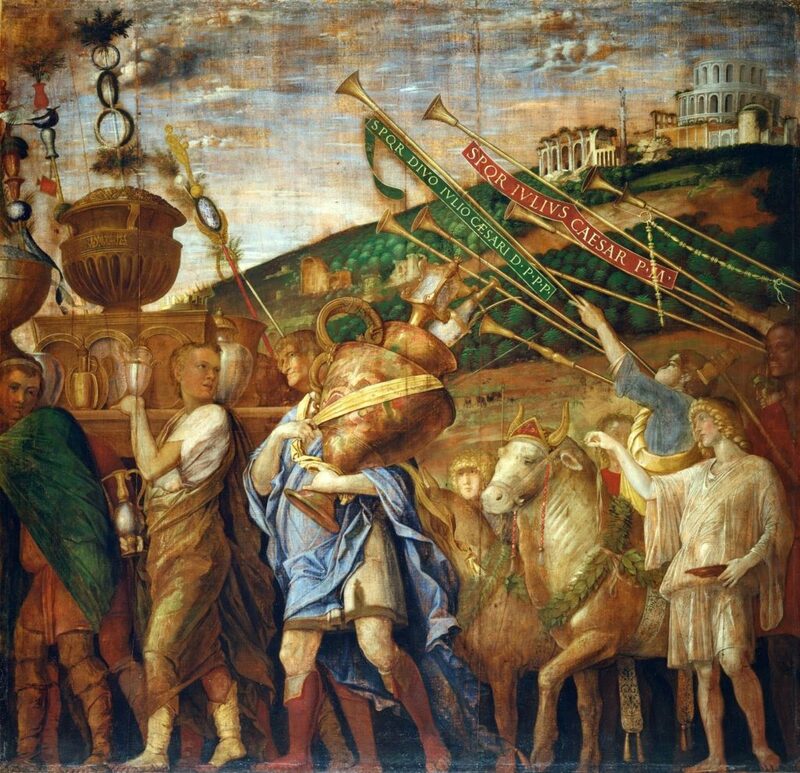 The Fool remains Il Mato (the Fool) but all else are whirled into a vortex of classical names ….Nerone (Nero), Catulo (Cattulus), Catone (Cato… no, not the Pink Panther one) and so on. 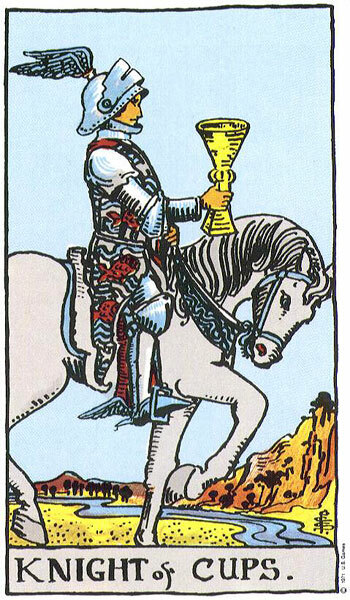 The images in this deck are richly coloured and brooding in their mood. 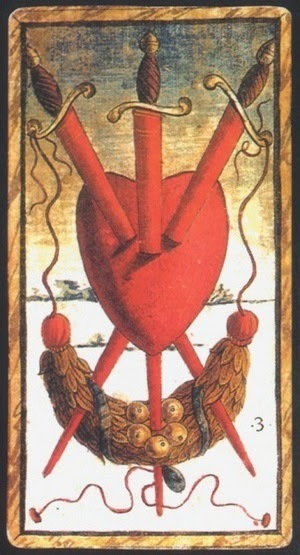 This deck is very important indeed, in that it has clearly formed the basis for the Rider Waite Smith deck. Look familiar? 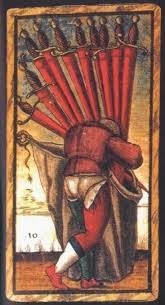 The Sola Busca’s 10 of Swords. As was the habit, the little Pages are not named – because in gaming decks there were only 3 court cards. 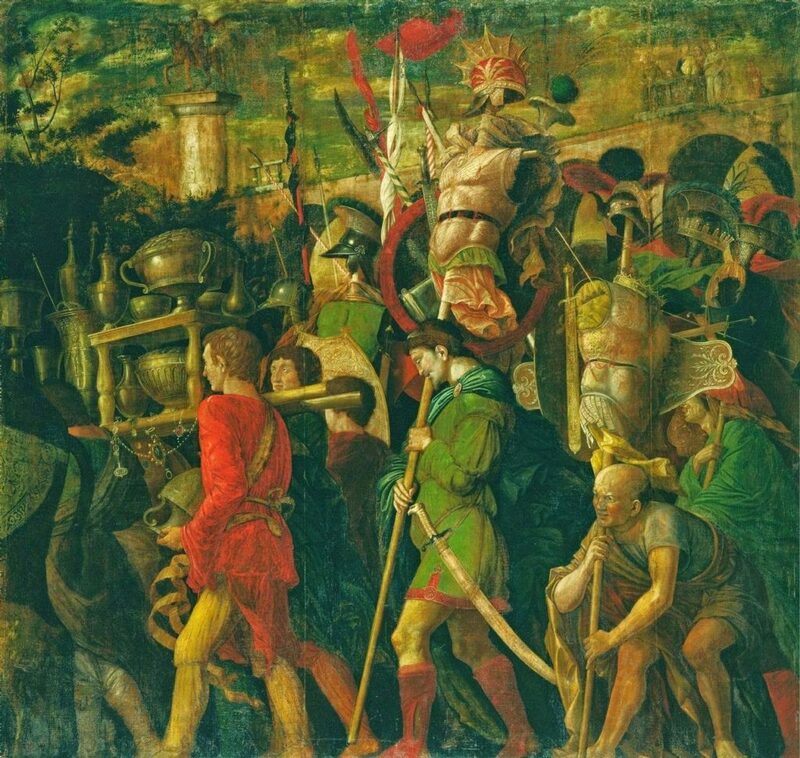 The names have some affinity with the Heroes, Warriors and Worthies, as previously looked at here on m’blog. 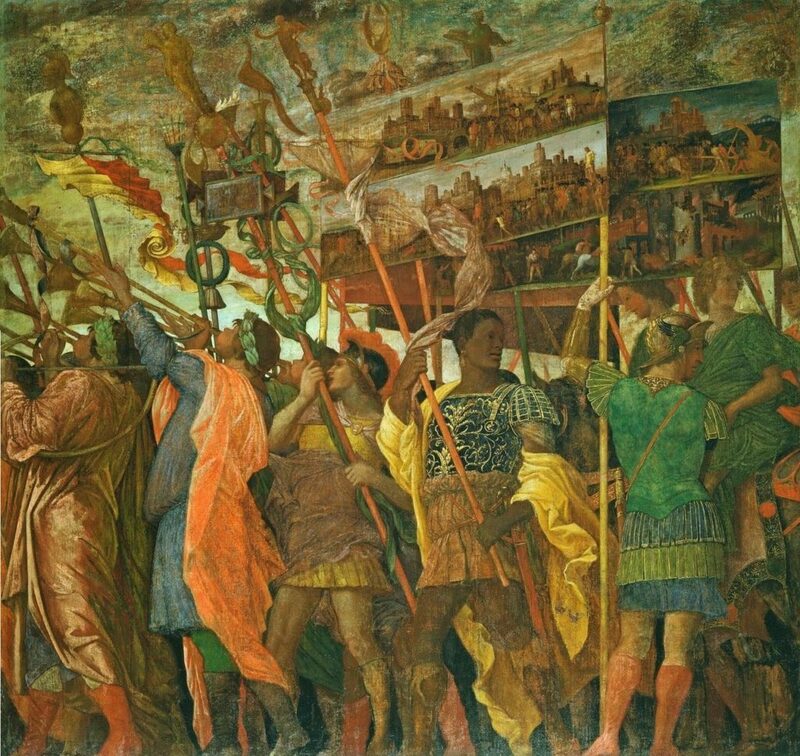 This is where my blog goes a bit off piste and veers utterly away from further discussion of the Courts, because I was very struck by the style of the vibrancy of colours, the all-male procession and the scale of the ‘booty’ and the similarity to the canvases of Andrea Mantegna’s Triumphs of Caesar which are housed at Hampton Court Palace in London. 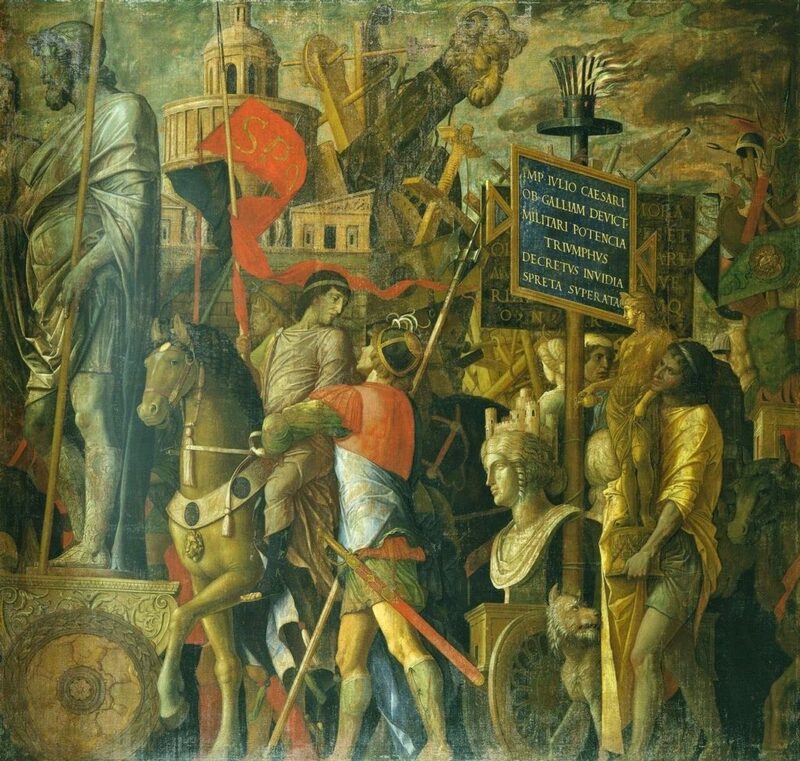 The nine paintings depict Caesar’s triumphant return from his campaign against the Gauls in a cavalcade of soldiers and booty. 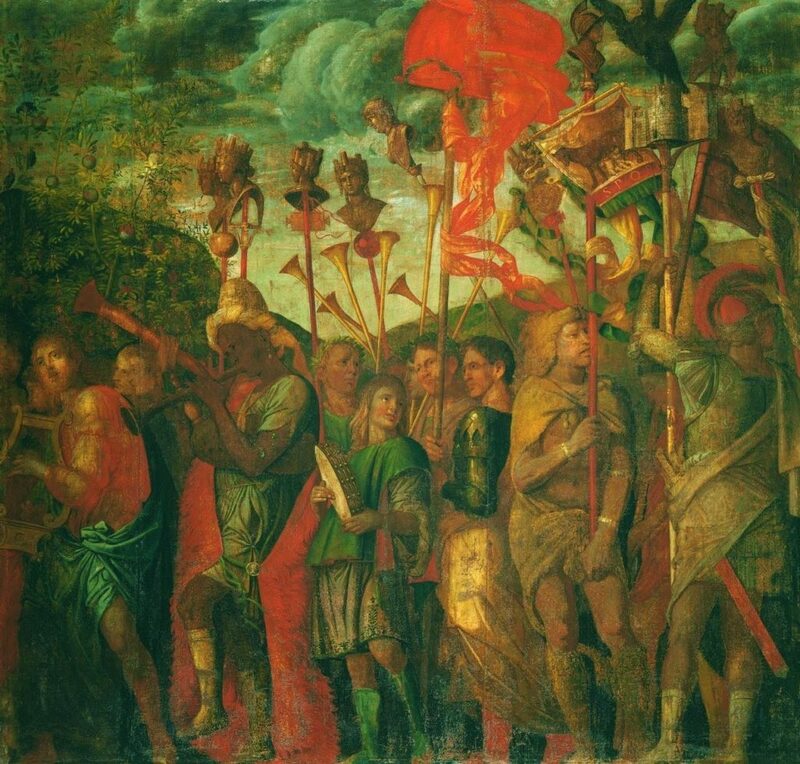 In his book ‘Lives of the Artists’ Vasari says: ‘The best thing Mantegna ever painted’ and the enormous canvases became extremely famous throughout Europe. 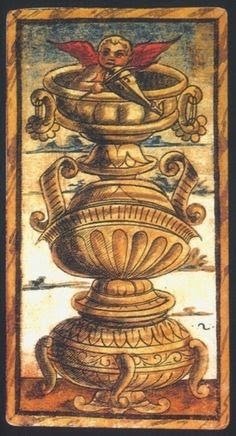 The scale of the vases? The artfully arranged trophy ‘Cups’? Look at the stuck-on breasts of Pallas. Do you think they resemble the bare breasts of the captive above? The cloudy skies? 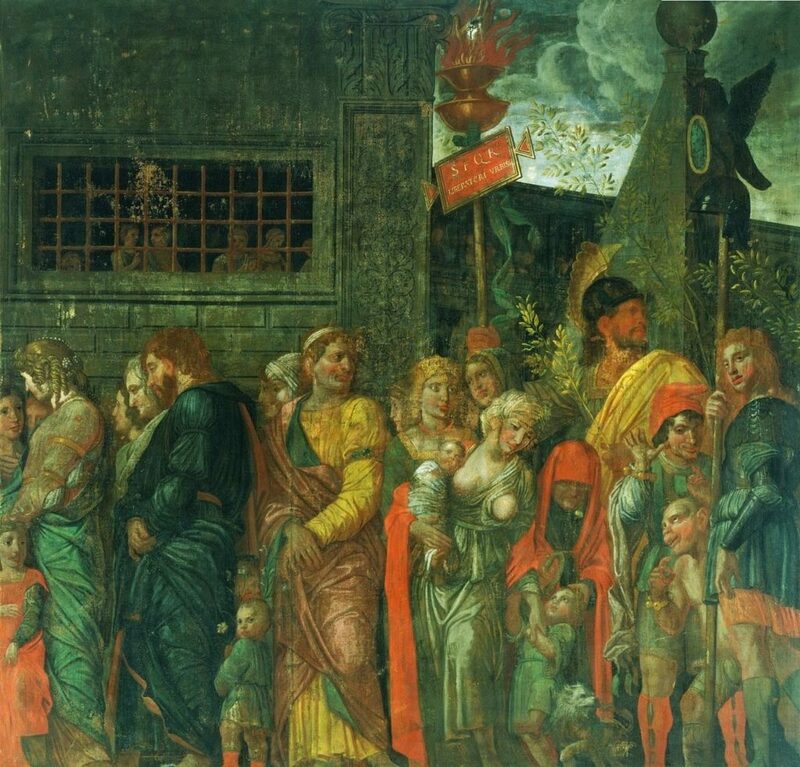 The only children depicted in the Triumph are captives. 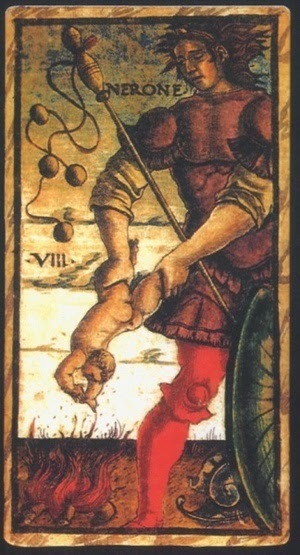 What about this child in the ‘Nerone’ (Justice) card of the Sola Busca? 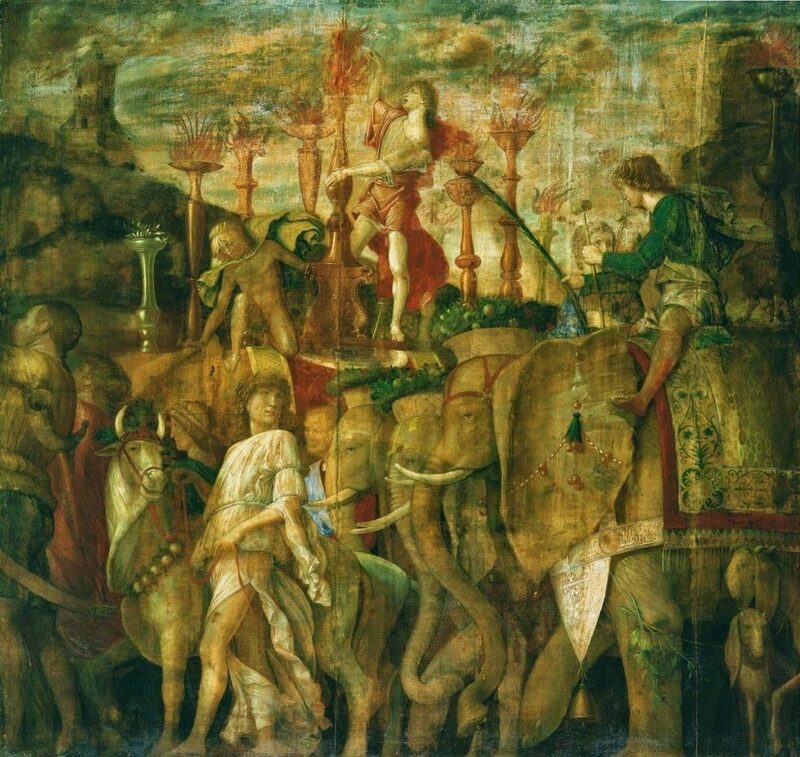 Perhaps the resemblances are pure fancy on my part, but if Mantegna’s paintings were famous throughout Europe, why wouldn’t a wealthy Italian Lord not want his own version? 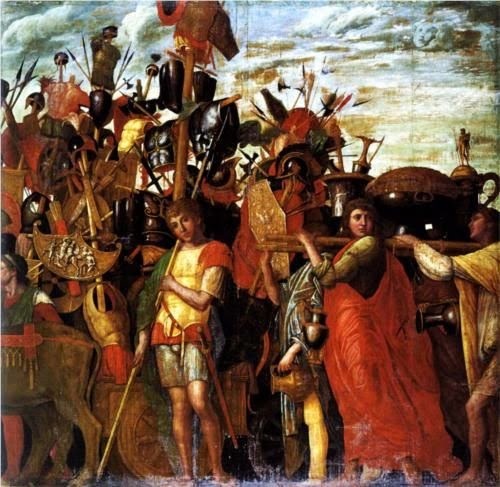 It has been suggestested that the creation of the Tarot’s Trumps IS based on Roman Triumph parades. 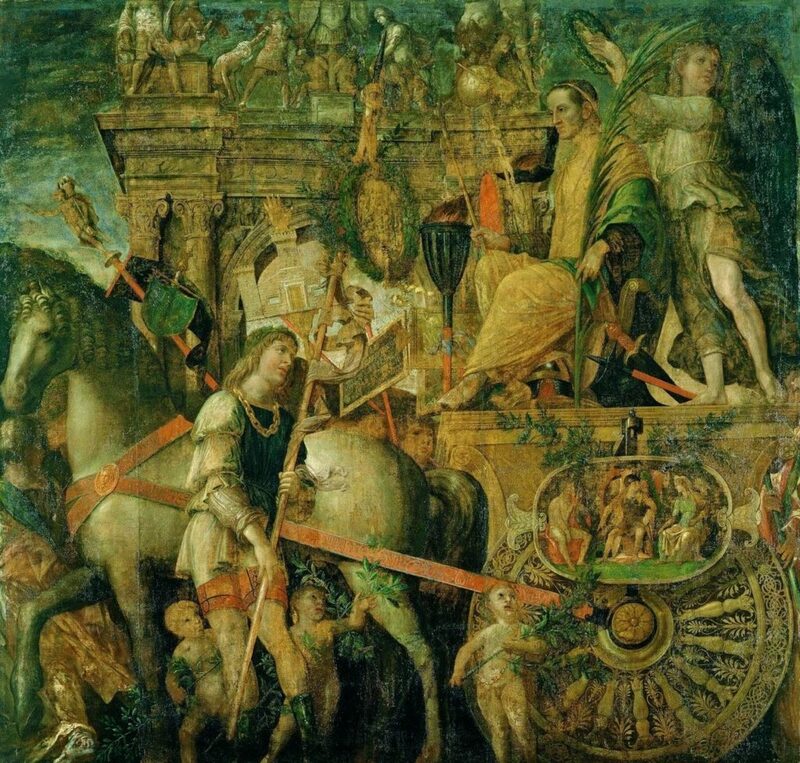 What if it was THIS one in particular, painted between 1484 – 1492? 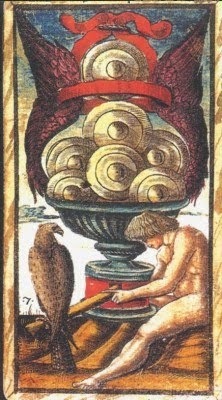 The Sola Busca Tarot is estimated, by its Tarot historian champion, Giordano Berti, to be around 1490-91. So the two dates dovetail together nicely. What do you think? Is the link allllllll in my head?! There do seem to be some striking similarities. I think you're on to something. Wow! Fascinating. Please do expound at will in PDF form. 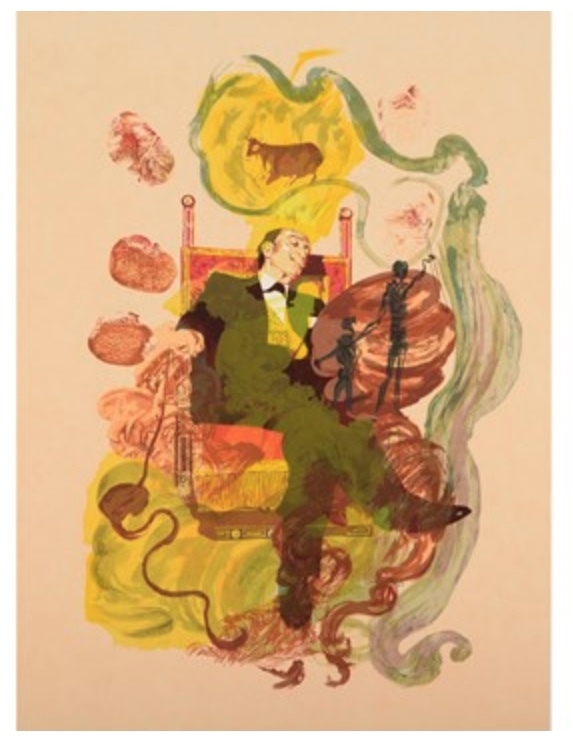 I can certainly see stylistic links in the art itself. Also, I had no idea that pictorial minors pre-dated the RWS, but here they are (do remind me if any of the other Renaissance-era decks have pictorial minors, though). T'is tempting to see the figurative links; just think of all the great material for deck images to be found in those grand artworks! I do like your theory. 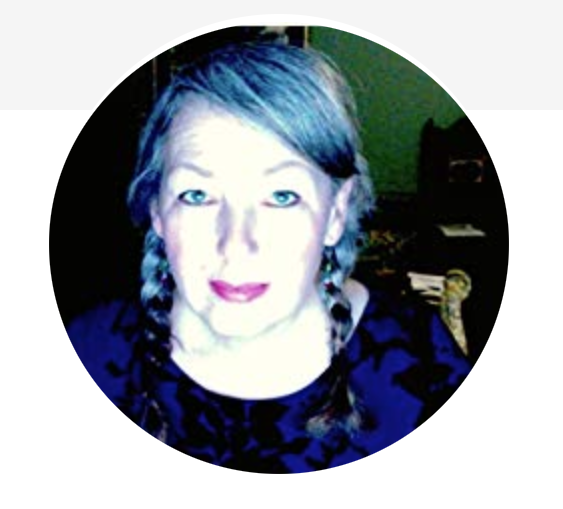 Yes, the Sola Busca was used by A E Waite and/or Pixie Smith as inspiration – a fair few of the minors resemble RWS minors. Although they are not all accorded the same number or suit in the RWS as they are in the Sola Busca. I am saving up to buy a good quality copy from Giordano Berti!